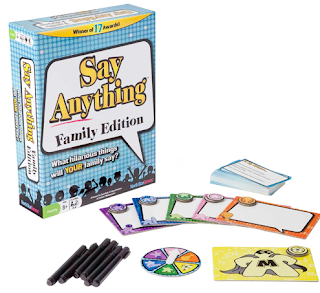 Say Anything Family is a game about what you and your loved ones think. It will get you talking, laughing, and having fun in minutes. It gives you the chance to settle questions that have been hotly debated for centuries. For instance, “What magical power would be the coolest to have?” or “What would be the most fun thing to throw off a tall building?” So dig deep into your heart or just come up with something witty – this is your chance to Say Anything! The game includes 60 question cards with a total of 360 topics! Dry erase boards are used instead of paper. Enjoy it with three to eight family members. Age recommendations are 8 and up. The game takes about 2 minutes to learn to play and 30 minutes to complete. Ask a question from the card you draw. Everyone else writes an answer and turns it face-up. Secretly choose your favorite answer. Everyone tries to choose which answer you picked. Say Anything Family retails for $19.99 and can purchased at Amazon, Target, ToysRUs and other retail outlets. Check out the other games offered at NorthStar Games!